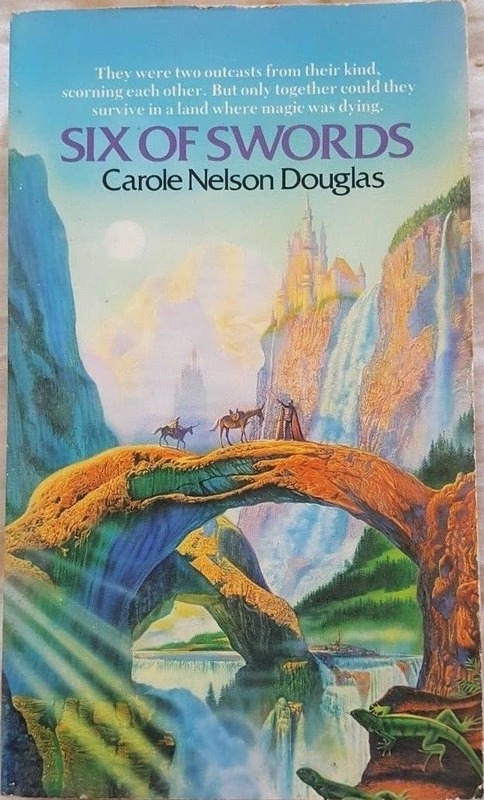 Carole Nelson Douglas has published a number of books. A journalist by trade, she started writing novels in the late 1970s. Six of Swords was her fourth published novel and her first foray into fantasy. 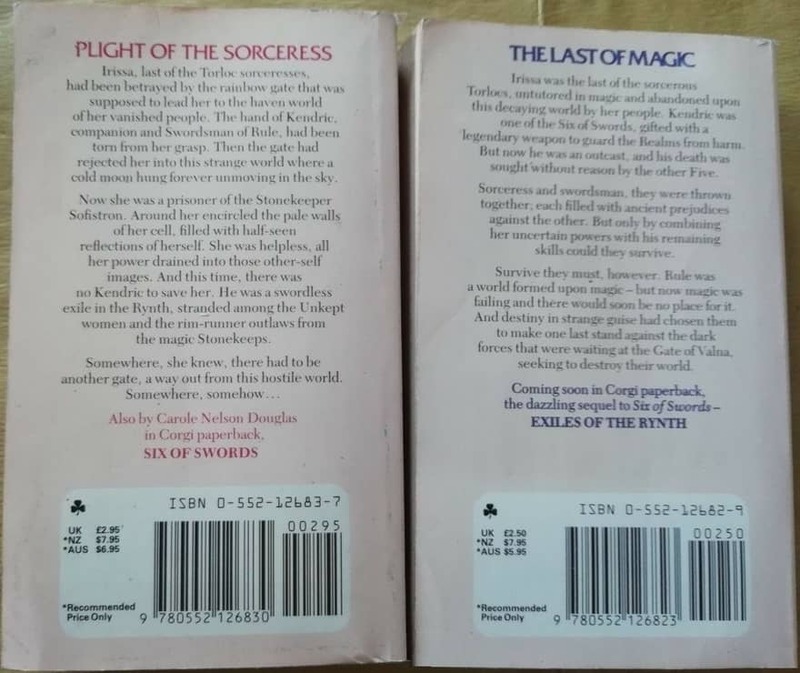 In researching this article I was a little saddened to see Six of Swords had not made it onto the various Top Fantasy Books of 80s lists I found, even though it was a best seller in its day! I do not think of this as a condemnation of the book so much as a statement of just how much the genre grew in the 1980s, and how many quality works were published. Something I only realised years later was that the title refers to tarot cards, not regular playing cards. Many tarot card decks have a Swords suite. I have the 345 page Corgi paperback published the UK in 1985, featuring Steve Crisp cover art. In the USA Del Rey/Ballantine initially published the book in 1982 with follow up runs annually until 1985. The Del/Rey/Ballantine version is slimmer at 276 pages and has a Darrell K. Sweet cover. A requiratur for 1980’s fantasy is the ubiquitous interior map. Six of Swords is no exception, providing a map of dubious quality and to be perfectly honest, which is nullius pretii to the story. Perhaps the map worked in a larger format, but in mass market paperback it is cluttered and difficult to read. 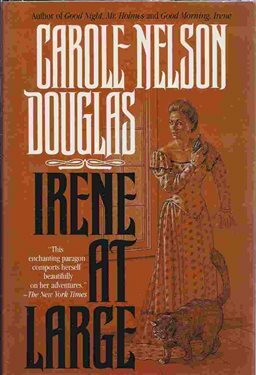 The story concerns two characters thrust together at the start of the book. Irissa is a Torloc, a race of humans who occasionally produce silver eyed seeresses with magical powers. The Torlocs are a dwindling race and Irissa is possibly the last of her kind born with such gifts. As a result she has been reared in relative solitude, cloistered away from people and things which may taint her. Irissa is brought up to avoid reflections, especially those in other people’s eyes, as a Torlocs’ power is accessed through their mystical silver eyes. Living in a realm called The Shrinking Forest she is introduced, while daydreaming near a pond, to a downed warrior. Well out of place in the secluded dell, the armoured warrior is sorely wounded and begs for her help. She assists him and in so doing changes her destiny. The warrior is Kendric, one of a revered band of six knights known as The Wrathmen. The Wrathmen, we learn, are great warriors, each representing one of the Six Realms. Encased in Iridescium (a black extremely strong metal which my mind still wants to call Iridium) plate armour and bearing ancient greatswords, they are charged with protecting the realms. We soon learn two disturbing truths: that Kendric is in his current state after being attacked by a brother Wrathman, and that Irissa, through tarrying and helping him, has literally missed a date with destiny. For when she returns to her home, the last Torloc stronghold of Rindell, there is nothing left. Rindell and its inhabitants have faded from existence, departing the realm via a mystical gate in search of a more favorable Torloc Homeland. All that remains is her mentor’s elderly cat and a cryptic departing message from her mentor. So begins Irissa and Kendric’s quest. She to find a gateway to be reunited with her people, he to discover what has gone so wrong to have set the realms and the Wrathmen against each other. But the debt he owes Irissa for saving his life through her untrained magical abilities sees him step into a protector role. Together they head off to Rule, the capital, where they expect to find answers. Kendric is the Wrathman from The Marshlands, the lowest and poorest of what are now the Five Realms, since the vanishing of the Sixth (Torloc) realm. He seems to be an equitable companion but also has a bit of a chip on his shoulder due to his low origins, and the fact that he is a Wrathman purely because of his gigantic stature. Yes, he’s big enough to fill the hereditary armour and wield the greatsword that comes with the job. But all the other Wrathmen were born to their hereditary task and have their own special, oft magical, equipment. He also has an innate distrust of Torlocs, addressing Irissa as Sorceress as oft as not. Finding no answers in Rule, merely more problems, Kendric and Irissa depart to find answers elsewhere, following vague clues as they journey through the realms. Still, this isn’t a Travel Atlas fantasy, in which the author has worked hard to create a world and damned if the characters aren’t going to set foot into every corner. Each realm is mentioned, but some are only referred to. This is not to say there is little detail. The author has a knack of passing on small bits of description, just enough to get the picture and let one’s mind do the rest. From The Rocklands with their dry storms, to Clymarind, the floating, moving island, she provides enough snippets to give one a good feel for the world. This is not Journey Quest either. While the two protagonists do travel, the story gives us snapshots from time to time, when important events occur. Without giving too much of the story away, Kendric and Irissa soon find themselves outcasts, relics of what is fast becoming a bygone era. Magic is making way for science. The Realms no longer have need of armored warriors hulking around with greatswords, or practitioners of any kind of magic, especially auslander Torlocs. They find themselves searching out others in the same predicament, to find a way to a mystical gate so that Irissa may become reunited with her folk, while on the lookout for the other Wrathmen of The Far Keep, whose brotherly oath appears to have been replaced by mutual animosity. Six of Swords was in some ways a bit of a mold breaker for its time. 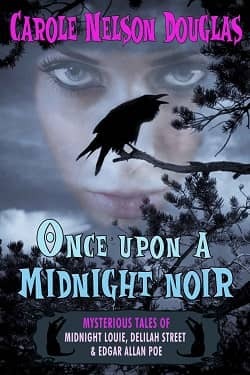 It moved away from the traditional quest template and created a new one, yet at the same time delivering sufficient action and intrigue to keep the reader interested. 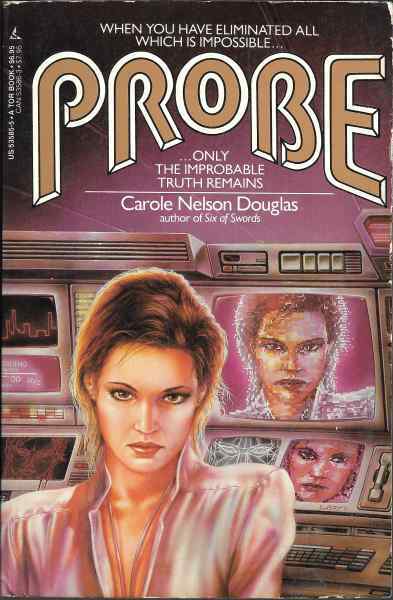 It tackled themes refreshing to eighties readers. Irissa too often encounters machinations which require her untapped powers, often with little concern for her own needs for self-realisation. Kendric has to deal with self-doubt, his own inadequacies – perceived or real — and a big question that is as relevant today as it was when the book was published: If your job defines you, what are you without your job? In some ways the book is a romance, in others a coming of age tale. The book could have been more fluid. It hops from event to event, creating a disjointed feeling, like a children’s treasure hunt where the only reason for going to a specific place is to get a clue leading to the next one. You never gets a feeling for the size of The Realms. They could be as large as Australia, or as small as Mauritius. As one event leads to the next, you get the feeling that the characters are being toyed with, chasing after dangled tidbits just beyond their reach. How can I put it? The plot seems a little linear perhaps? 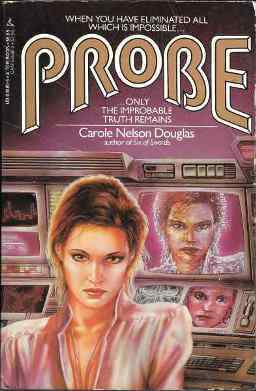 Carole Nelson Douglas’ training as a journalist comes through insofar her prose is crisp and easy to read, with no unnecessary rambling. This is not to say she has oversimplified, using many nouns and adjectives which hopefully broaden one’s repertoire of cool words, rather than one inserted simply to add a degree of antiquity. The word cabochon could possibly have been used a little less. One thing I loved about The Realms was the fauna. The animals are sufficiently different as to break away from standard fantasy tropes. There are six legged lizards in The Rocklands, Weepwater Wraiths who dwell amongst the roots of Weepwater Trees in The Shrinking Forest. Irissa and Kendric ride horned Bearing Beasts, which I perceived as being only nominally equine. Semi intelligent Moonweasels stalk the darkness, ‘ware the unsuspecting traveller, while Sleeping Water Beasts feed on the weeds in the sea surrounding the mobile island of Clymarind. Possibly the most detailed of the animals are the Falgons, which appear to be a kind of feathered, beaked drake. These are commonly known as Dwarf Falgons, which are highly prized pets, but there is mention of the fact there were once Empress Falgons, of giant stature. The couple develop a close bond that is put to test as events and counter manoeuvres occur. They meet other practitioners of magic, some supposedly helpful, others with clearly malevolent intentions. Throughout the story the author drops snippets of information as to what The Wrathman really represent, and why the Realms are literally coming apart at the seams. They are unnaturally bonded together and, as the magic dies, so are those bonds coming apart. I thoroughly enjoyed this book. The author clearly honed her skills with Six of Swords, which allowed her to deliver a superior sequel. 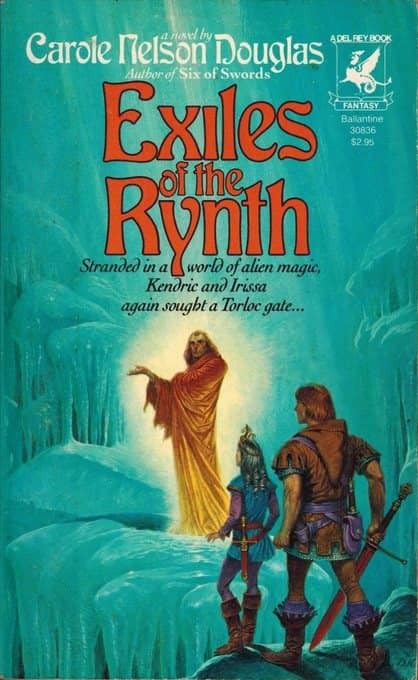 Published in 1984 Exiles of the Rynth continues Kendric and Irissa’s quest to find her vanished people. Looking at the publication dates and cover are of the two Corgi versions, it is apparent they were launched almost consecutively, with Exiles of the Rynth seeing publication in 1986. 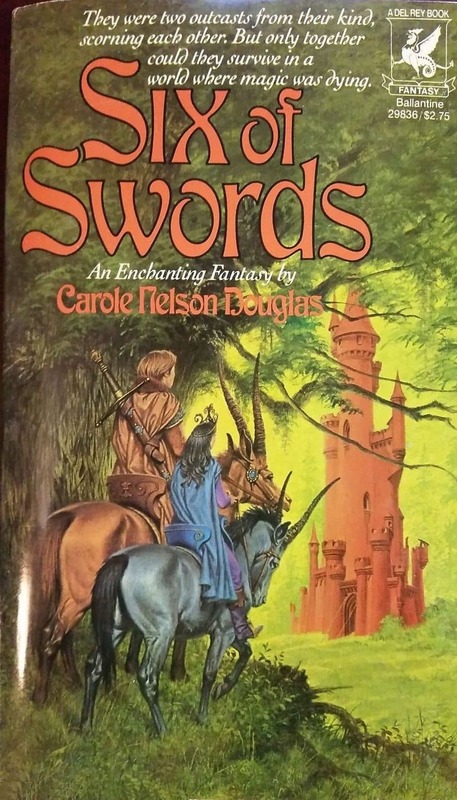 The Corgi version also features Steve Crisp art and is 416 pages long, whereas the Del Rey/Ballantine version is a slimmer 343 pages and also retains the same artist as Six of Swords – Darrel K Sweet. It is necessary to have a bit of a spoiler to explain how Kedric and Irissa ended up where they are when the book open. Six of Swords saw them leaving The Realms via a mystical gateway ostensibly leading to the new homeworld of the Torlocs. Simply put, the gateway rejected them. All I can divulge is there was some magical vs non magical bigotry involved. The couple wind up in separate locations on the new world. Kendric in a desolate, dangerous land called The Rynth, while Irissa arrives up in a more favorable land, and also finds her innate magical powers considerably enhanced from what they had dwindled to in The Realms. Each has to find their own way in this new land, facing various trials before being reunited. The book builds on interpersonal events in Six of Swords and examines their interpretation thereof. Each has to face and overcome startling new challenges that have a lot to do with magic, while working out their own relationship dynamic. These books do border on romance, and are stronger for it. Kendric and Irissa also have to examine their ultimate goals. He as a jobless Wrathman, she as a homeless Torloc. The characters have to grow and make choices about their future when their preordained careers disappeared, something many a reader can relate to. One of the big questions comes down to whether they accept their situation and eke out a living in this new world, or to try and find a gateway and attempt to reach the Torloc homeland, bearing in mind their previous attempt was a failure. 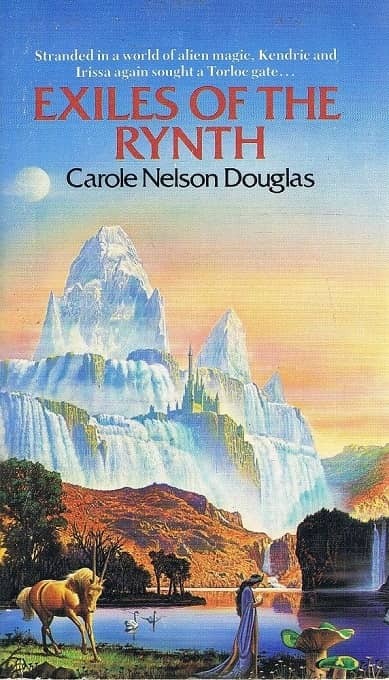 In terms of world building, Douglas has produced a real gem with Exiles of the Rynth. Six of Swords showed us her universe allows for a multitude of worlds. With the right arcane knowledge and resources, one may travel between them. The world of Exiles of the Rynth is magically unique. It is comprised of habitable lands called The Inlands of Ten which are bordered by the inhospitable, tundra like area known as The Rynth, which in turns is encircled by an artic like Cincture. An ice arch thrusts into the sky from The Cincture and holds a moon called The Overstone in place in the sky. The whole setup had me imagining a kind of Flat Earth in a Snow Globe – pretty cool and different. The Inlands are of a magical origin, each coming into existence due to the power of a magical stone The finders of magical stones became known as The Stonekeepers, each developing a hospitable realm from a portion of The Rynth. Each realm has in turn taken on the personality of the stone that developed it, from copper like desert to watery wonderlands. What is interesting about the dynamic is that neither of these groups are outcasts or runaways. They were free to make their choice, and prefer their current life to remaining in their hereditary Stonekeep, forced to vie for the position of First Son, or be traded with another Stonekeeper as an addition to their bevy. Suffice to say Kendric and Irissa must become acquainted with the social structures of The Inlands of Ten and forge alliances to survive, find whether another gate exists, and if so, where it is. In so doing they encounter some interesting characters, brave dangers, and set in motion events that could change the very nature of the world, while at the same time trying to repair their fractured relationship. Exiles of the Rynth was an enjoyable read that presented some unique concepts, alongside real characters with their own concerns and motivations. While the fauna and flora are not perhaps as delightful as in Six of Swords, they are sufficiently unique to add an extra dimension of fantasy. 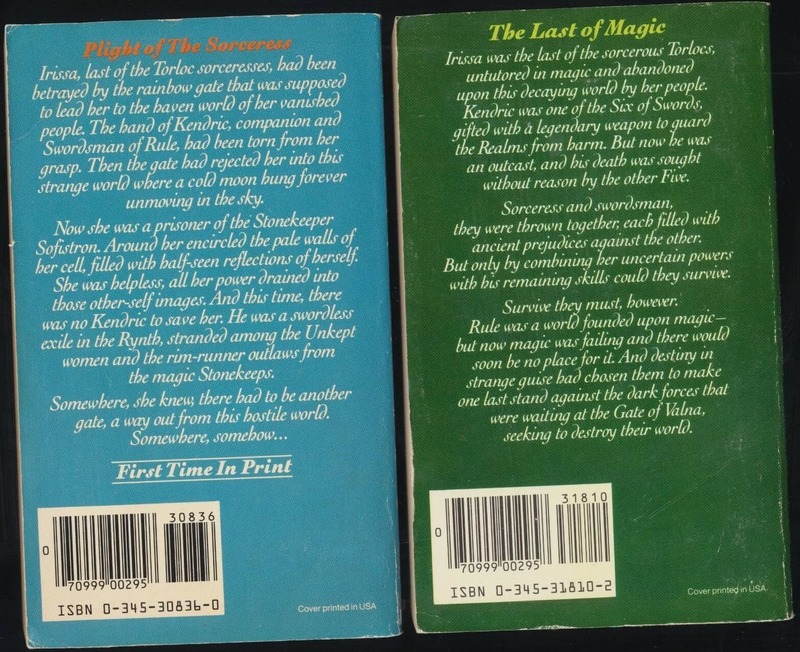 I look forward to the Sword and Circlet trilogy that follows on from these two books. As a passing note, Exiles of the Rynth also has a map. It is not necessary insofar it does not contribute to the story in any real way, but at least is legible and quite nicely drawn. 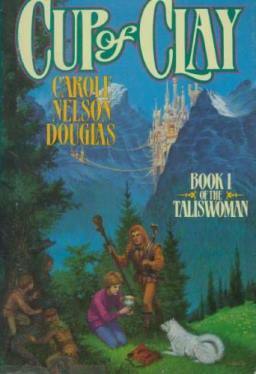 Carole Nelson Douglas has published many other books since her foray into traditional fantasy. She has dabbled in Science Fiction with her Probe and Counterprobe novels and returned to fantasy with her Taliswoman dilogy. 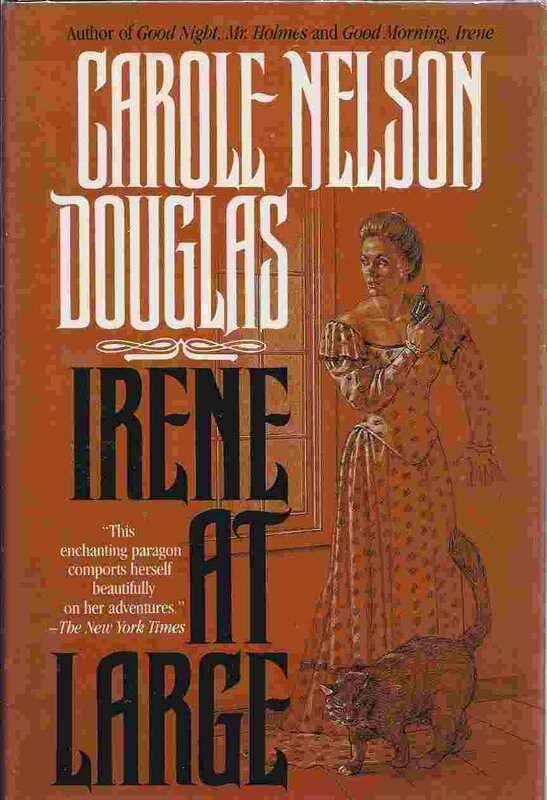 Black Gate’s Bob Byrne made brief mention of the authors successful Irene Adler books. It may prove interesting if he were to cover these in detail sometime? 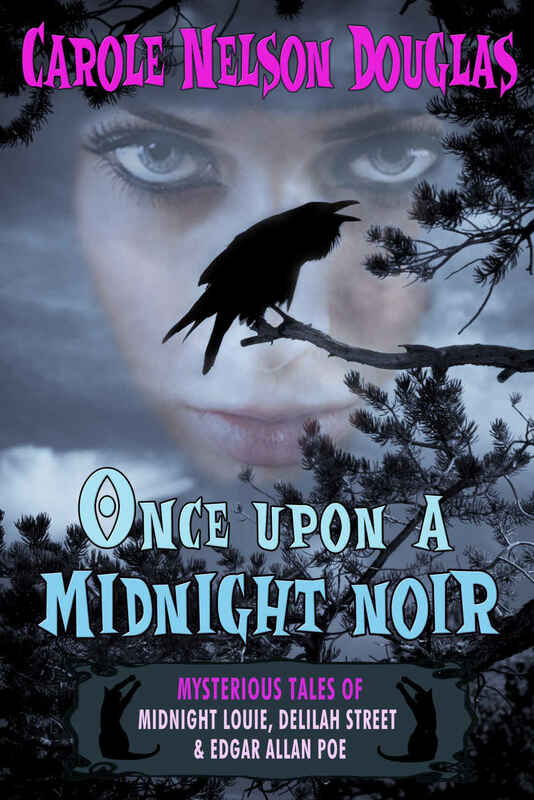 Other series successful series’ are Delilah Street – Paranormal Investigator and the Midnight Louie Mysteries. 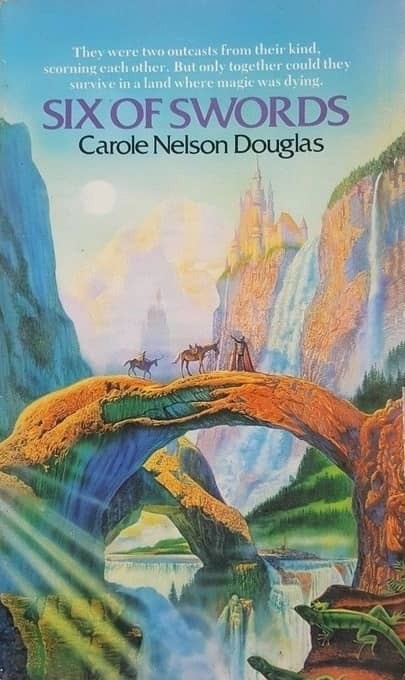 More information can be found at Carole Nelson Douglas’ Official Author Site here. Tony Den has published a number of reviews at Black Gate, most recently is a look at The Archipelago shared world initiative. He has given up on claims that his RuneQuest.orc website will find its way onto a WordPress platform. 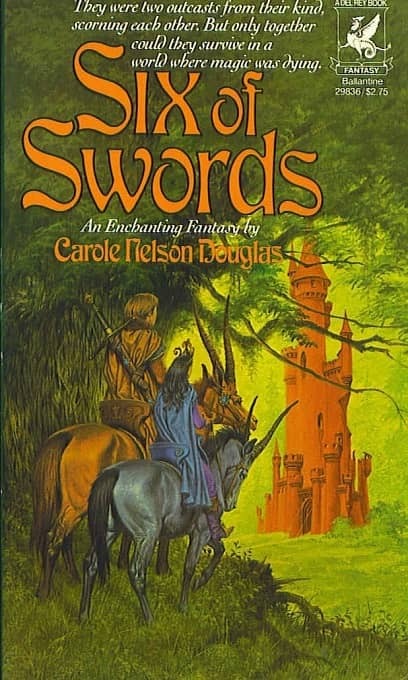 That Ballantine cover of Six of Swords looks awfully familiar, but I have no recollection of reading the book.